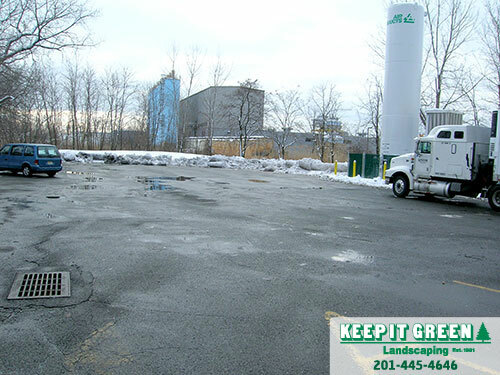 Commercial Snow Plowing & Removal Services for parking lots, office buildings, and more to the Meadowlands NJ. Call today! we manage winter's snow and ice events to provide safety. Since 1981 Keep It Green Landscaping has been satifsying our clients by providing quality snow and ice removal services, our winter snow plowing operation is based in the heart of the Meadowlands, in Moonachie, NJ 07074. Our clients appreciate that we are an award winning snow and ice management contractor that values their business and meets their specialized needs as commercial clients. Our snow and ice management services include snow plowing, snow removal, ice control, and salting service in the following towns: Carlstadt, Moonachie, East Rutherford, Rutherford, Lyndhurst, Wood-Ridge, Wallington, Hasbrouck Heights, Teterboro, Little Ferry, South Hackensack, Secaucus and other Bergen county, Hudson county and Passaic county locations. If your company has just moved into a new building. 2018-2019 season commercial snow plowing / snow removal contract TODAY! 2018-2019 Snow Plowing Contracts Available Now. Don't Wait Until It Is Too Late! It's is never too early to prepare for winter's snow and ice. Call Now For a Professional Consultation. snow and ice at your location. NOW is an excellent time to sign your snow plowing / snow removal contract because as a professional snow removal contractor we never stop thinking about snow. Why put your customers and employees at risk? Trust your snow and ice management to Keep It Green Landscaping, a proven professional providing snow and ice management to satisfied customers in the Meadowlands Area for over three decades. Commercial Snow Plowing and Commercial Snow Removal Services Provided for parking lots, office buildings, and retail stores and industrial complexes in Carlstadt, Moonachie, East Rutherford, Rutherford, Lyndhurst, Wood-Ridge, Wallington, Hasbrouck Heights, Teterboro, Little Ferry, South Hackensack, Secaucus and other Bergen county, Hudson county and Passaic county locations. On Site Examples of Keep It Green Landscaping's Snow and Ice Management. All of our snow plowing trucks and snow removal equipment are highly maintained as well as prepared before a snow storm. After each snow storm all snow plowing trucks and snow removal equipment must pass a rigorous post storm checklist to ensure they are ready to roll for the next snow storm. By holding to high standards in this way, we can keep our snow plow trucks and snow removal equipment going when the going gets tough. Keep It Green Landscaping has an excellent safety record. We're proud to be recognized as one of the safest snow and ice management companies, not only in New Jersey but in the nation. Your employees and customers will enjoy the benefits of hiring a professional snow and ice removal company with safety trained professional snow plow drivers and snow removal technicians. Representing the best of the snow and ice management industry, Excellence in Business winners are judged by their peers on business practices, customer satisfaction, community relations and accountability. The Excellence in Business Award is awarded to only three companies nationwide each year and is presented at the SIMA (Snow and Ice Management Association) National Conference. Keep It Green Landscaping has been servicing our company since 1983. We have a yearly plowing contract for our AM transmission facility on Paterson Plank Road in Carlstadt, New Jersey. In the event of a snowfall if we cannot access the facility in an emergency and we are off the air this means that we are out of business with a resultant loss of thousands and thousands of dollars. This sets the stage for the importance of access. Keep It Green Landscaping has never once in 23 years failed to clear the premises within very short order after a snow or ice event no matter when it occurs. Keep It Green Landscaping never hesitates to call in the event of any kind of problems such as a vehicle poorly parked which would impede the plowing. If a problem arises and a call to Keep It Green is necessary there is ALWAYS a live person to talk to. Dyle MacGregor, owner of Keep It Green Landscaping has been working with us since 1988. He has been very reliable and competent. He is very careful not to damage any of our landscaping, and places the excess snow in a way to give us ample parking. Dyle realizes that in our business those visiting the funeral home are in proper attire and women may be wearing heels. He is always concerned that our property is neat and free of snow and ice. There are days he may be needed more than once because of our flexible visiting hours. People come and go from 8 am (day of funeral) to 10 pm. When snow is in the forecast, his office staff not only calls us beforehand to find out our schedule for the next few days but he also checks on us throughout the day. If we have any problems we simply call his office and he immediately responds to our call. We have been very satisfied with his service, friendliness and dependability. Landscaping for your Excellence in Business Award. Keep It Green Landscaping has been our snow removal provider since the winter 2000/2001. Their services are supplied with great professionalism. The quality is consistent whether there is a blizzard or only a couple of inches of snow. We have always seen that the provider pays great attention to detail and always offers great variation in supplies and services. They work with us to make sure all our needs are seen to. Their customer service is excellent and any questions are replied to in a very timely manner – there is always someone to answer the phone.